Batangas City– President Benigno Aquino III kicked-off the next-phase development of the Malampaya Deepwater Gas-to-Power project with a visit to its Onshore Gas processing Plant in Batangas on August 9, 2011. During the visit, President Aquino witnessed the signing of the first contract awarded for the project by the Service Contract 38 (SC38) consortium. A proposed Executive Order creating an Upstream Petroleum Task Force to ensure success of the national government project was likewise presented by the Department of Energy (DOE). President Benigno Aquino III, together with DOE Secretary Jose Rene Almendras and Shell Country Chairman Edgar Chua, witnessed the contract signing of the Basic Design and Engineering Package (BDEP) Contract, the first contract awarded by the MP2&3 Development Project. Sealing the deal were (left to right) SPEX MP2&3 Project Manager Antoine Bliek, SPEX Managing Director/LSUR Sebastian Quiniones, Fluor Daniel General Manager Dan Spinks and Fluor Senior Vice President and Head of Offshore Solutions, Lee Richardson. Malampaya’s next-phase development aims to maintain the level of production and maximize the recovery of indigenous natural gas from the Malampaya and Camago reservoirs. “Malampaya Phase 2” will entail drilling and development of two additional wells by 2014; “Malampaya Phase 3” will involve the installation of a new platform where additional equipment and facilities will be housed by 2015. The projects, entailing new investments of USD1 billion, are seen to further benefit the Philippines in energy self-sufficiency and government revenues, and will continue to be a major source of power for Luzon’s energy requirements in the years to come. Malampaya is one of the largest and most significant industrial endeavors in Philippine history. 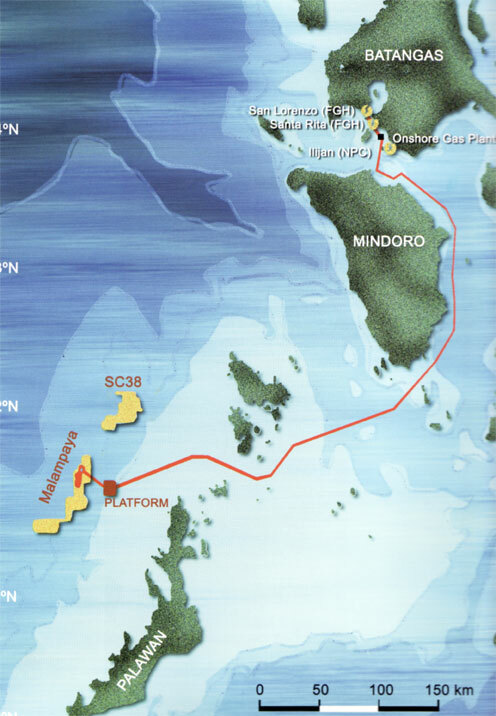 It is a joint undertaking between the Philippine national government and the private sector spearheaded by the DOE, and developed and operated by Shell Philippines Exploration B.V. on behalf of joint venture partners Chevron Malampaya LLC and the PNOC Exploration Corporation under SC38. Production of natural gas to fuel three gas-fired power stations with a combined capacity of 2,700 MW commenced in October 2001 and has been providing benefits including meeting 40-45% of Luzon’s power generation requirements, reduced oil imports, stable supply of energy, unprecedented government revenues and cleaner source of power. President Benigno Aquino III, poses with the operations engineers of the Malampaya Onshore Gas Plant.